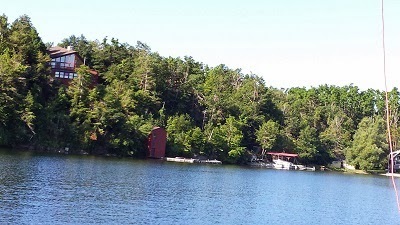 After Cape Vincent and a rough night tied to dock, we made our way to White Bay in Henderson Bay, NY. 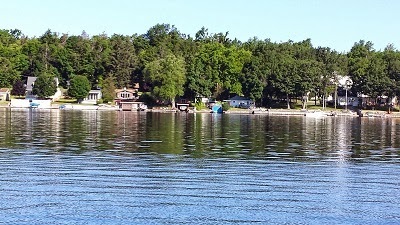 We had this lovely Bay to ourselves except for the odd powerboat during the day with waterskiers. An older gentleman motored by at one point close enough to call over and welcome us to the Bay. He motored around our stern to read our home port and then asked where PEI was. After a short conversation he told us to feel free to stay as long as we liked and to enjoy ourselves and then he motored away. We spent two nights there, well protected from the weather and enjoying peace and relaxation and doing a bit of work. One of the benefits of being self employed is that as long as you have a laptop you have your work with you. Working in the cockpit beats sitting in an office any day. On Friday, July 11th we made our way to Sackets Harbor, New York, a pretty little town which had strategic importance during the War of 1812. Navy Marine is a full service marina, so after a pumpout, diesel fill and water top up, we took a berth for the night. 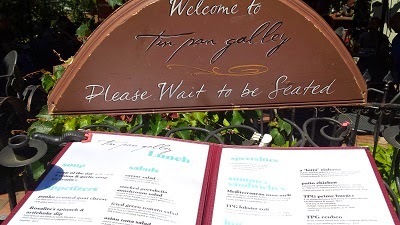 We took a walk into town for a late lunch and visited the Tin Pan Galley. We sat in their lovely patio and had a wonderful lunch. Their spinach dip is amazing. After lunch we walked over to the grocery store and then it was back to the boat for laundry. That evening we walked up to the theatre to catch a stand up comedy show which was very entertaining. The next day we met some friends from Kingston, who camp near Sackets Harbor, and went for a sail. The wind was light but we had a nice sail for a few hours. Early afternoon we dropped them off at the marina and headed back across the Lake. Although we had really wanted to stay a few days longer, we had to be back in Kingston for Monday and Sunday was calling for thunderstorms and heavy rain. At least we did get to visit the New York side which has been on our bucket list since arriving in Kingston.